Howick tailored suit. £70 delivered (was £250) @ House of Fraser. There is also link in the first post to another suit that is £62 delivered. This popped up in my email this morning. The £75 Slaters dealed (linked below) annoyed me, so I thought I'd post this as an example of how to get a half decent suit for similar money. Certainly better quality than Slaters. I'll post a link to individual suit items in next post. Delivery is free if total over £50 so price is slightly more if only one is purchased. Not sure what's going on here. It shows up if I go through the House of Fraser eBay page, but then when I copy the link in here it doesn't work. Very strange. Item number is 110903117911 for the jacket. Does that help? Think I might have fixed it now. However I'm not sure how House of Fraser can call it a Tailored Suit, that being one which is made-to-measure. Good find. Feel free to post that as a deal of your own if you like, it should do well. 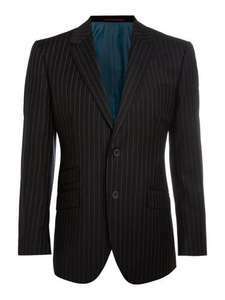 Its free delivery if you spend over £50, so I just got this suit for £62. Also the original suit should be £70. Can anyone comment on their quality? This isn't a made to measure suit so cannot therefore be tailored. I think the word "tailored" refers to the fit which I would imagine is quite slim. Didn't realise the free delivery counted on eBay store. I've updated the price. It's tailored fit, which is slimmer than usual but not so skinny that you need AIDS to get in it. Just recieved my suit. Good quality and fit. I bought one of these in the Birmingham store today and am very happy with it. 100% wool suit at this price is amazing and not to be confused with the usual poly or wool blend suit deals often seen on here.